German territories lost after both World Wars are shown in black, present-day Germany is marked dark grey. The territorial changes of Germany include all changes in the borders and territory of Germany from its formation in 1871 to the present. Modern Germany was formed in 1871 when Otto von Bismarck unified most of the German states, with the notable exception of Austria, into the German Empire. 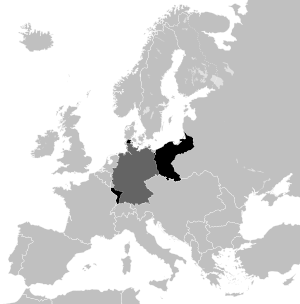 After the First World War Germany lost about 10% of its territory to its neighbours and the Weimar Republic was formed. 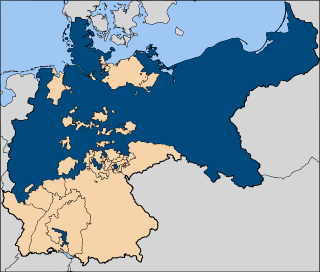 This republic included territories to the east of today's German borders. The period of Nazi rule from the 1930s through the end of the Second World War brought significant territorial losses for the country. 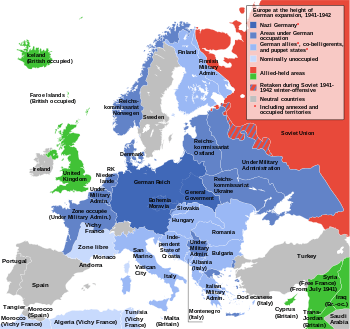 Nazi Germany initially expanded the country's territory dramatically and conquered most of Europe, though not all areas were added to Germany proper. The Nazis' fortunes changed after the failure of the invasion of Soviet Union. The Nazi regime eventually collapsed, and the Allies occupied Germany. Immediately after the war, all territorial gains were reversed and pre-war Germany was split into British, French and American occupation zones in the northwest, west and south and a Soviet occupation zone in the centre; the capital Berlin was similarly divided into four sectors. The former eastern territories of Germany were ceded to Poland and the Soviet Union and the Oder and Neisse Rivers became Germany's new eastern boundary. This territory became Poland's so-called "Recovered Territories", while approximately one-third of East Prussia became Russia's Kaliningrad Oblast; virtually the entire German population in these areas was expelled or fled. In the west, the Saar area formed a French-controlled protectorate with limited autonomy, but its own citizenship laws. With the onset of the Cold War, the western part of Germany was unified as the Trizone, becoming the Federal Republic of Germany in May 1949 ("West Germany"). Western-occupied West Berlin declared its accession to the Federal Republic of Germany in 1949 but was denied by the occupying powers. The Soviet zone, including the Soviet sector of Berlin, became the communist German Democratic Republic ("East Germany") in October the same year. Effective 1 January 1957 the Saar Protectorate declared its accession to the Federal Republic of Germany, as provided by its Grundgesetz (constitution) art. 23 (Little Reunification). Following the end of the Cold War, East Germany, including East Berlin, and West Berlin used the same West German constitutional clause and declared their accession to the Federal Republic of Germany effective 3 October 1990 – an event referred to as German reunification. Part of the motivation behind the territorial changes is based on historical events in Germany and Western Europe. Migrations that took place over more than a millennium led to pockets of Germans living throughout Central and Eastern Europe as far east as Russia. The existence of these enclaves was sometimes used by German nationalists, such as the Nazis, to justify territorial claims. The territorial changes of Germany after World War II can be interpreted in the context of the evolution of global nationalism and European nationalism. The latter half of the 19th century and the first half of the 20th century saw the rise of nationalism in Europe. Previously, a country consisted largely of whatever peoples lived on the land that was under the dominion of a particular ruler. As principalities and kingdoms grew through conquest and marriage, a ruler could wind up with many different ethnicities under his dominion. The concept of nationalism was based on the idea of a "people" who shared a common bond through race, religion, language and culture. Furthermore, nationalism asserted that each "people" had a right to its own state. Thus, much of European history in the latter half of the 19th century and the first half of the 20th century can be understood as efforts to realign national boundaries with this concept of "one people, one state". Many interior conflicts were a result of more or less pressurising citizens of alternative ethnicities and/or other native languages to assimilate to the ethnicity dominant in the state. Switzerland was the bright exception showing that patriotism only needs civic pride and legal equality, not a common native language. Much conflict would arise when one nation asserted territorial rights to land outside its borders on the basis of an ethnic bond with the people living on the land. Another source of conflict arose when a group of people who constituted a minority in one nation would seek to secede from the nation either to form an independent nation or join another nation with whom they felt stronger ties. Yet another source of conflict was the desire of some nations to expel people from territory within its borders because people did not share a common bond with the majority of people of that nation. The North German Confederation, led by the Kingdom of Prussia, was combined with the southern states of Baden, Württemberg, Bavaria and Hesse and the formerly French newly annexed Alsace-Lorraine to form the German Empire in 1871. In some areas of Prussia's eastern provinces, such as the Province of Posen, the majority of the population was Polish. Many Lorrainians were by native language French. Most of the Alsatians and the Lorrainians of German native language rather clung to France, despite all nationalistic claim that language and culture would and should determine one's national affiliation. Britain ceded Heligoland to Germany in 1890 in accordance with the terms of the Heligoland–Zanzibar Treaty. The Heligolanders, then still prevailingly fluent in their Heligolandic dialect of North Frisian, adopted German citizenship, like many other Frisians of Germany along the North Sea coast. As part of the Treaty of Brest-Litovsk, Russia's new Bolshevik (communist) government renounced all claim to Finland, the future Baltic states (Estonia, Latvia and Lithuania), Poland, Belarus, Ukraine. 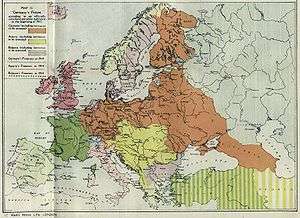 Regarding the ceded territories, the treaty stated that "Germany and Austria-Hungary intend to determine the future fate of these territories in agreement with their population" with few other effects than the appointment of German rulers to the new thrones of Finland, Latvia, Lithuania, and Poland. Northern Schleswig including the German-dominated towns of Tondern (Tønder), Apenrade (Aabenraa) and Sonderburg (Sønderborg) in Schleswig-Holstein, after the Schleswig Plebiscite, to Denmark (area 3,984 km², 163,600 inhabitants (1920)). The Prussian provinces Posen and West Prussia, which Prussia had annexed in Partitions of Poland (1772–1795), were returned to reborn Poland. Most of this territory had already been liberated by local Polish population during the Greater Poland Uprising of 1918-1919 (area 53,800 km², 4,224,000 inhabitants (1931), including 510 km² and 26,000 inhabitants from Upper Silesia). Minor areas of both the provinces remained in Germany and were combined to become the new Prussian province of Grenzmark Posen-West Prussia. On the territories granted to Poland remained a sizeable German minority. The Hlučín Region (Hlučínsko around Hulczyn) of Upper Silesia to Czechoslovakia (area 316 or 333 km², 49,000 inhabitants). The area of Eupen-Malmedy to Belgium, along with the Vennbahn railway trackbed (which created six German enclaves within Belgian territory). The northern part of East Prussia as Memelland under control of France, Italy, Japan and the United Kingdom, later transferred to Lithuania without a plebiscite. The area of Soldau in East Prussia (a railway station on the Warsaw-Danzig route) to Poland (area 492 km²). From the eastern part of West Prussia and the southern part of East Prussia Warmia and Masuria, a small area to Poland (see East Prussian plebiscite); despite nationalistic claim that ethnicity should determine national identity, a majority of the Slavonic Masurians voted for Germany. The Saar area to be under the control of the League of Nations for 15 years, after that a plebiscite between France and Germany, to decide to which country it would belong. During this time the coal went to France as war reparations. The port of Danzig (now Gdańsk, Poland) with the delta of Vistula river at the Baltic Sea was made the Free City of Danzig (Freie Stadt Danzig) under the League of Nations. (area 1,893 km², 408,000 inhabitants (1929)), 90% Germans. Germany acknowledges and will respect strictly the independence of Austria. The Sudeten Germans had attempted to prevent the German language border areas of former Austria from becoming part of Czechoslovakia in 1918. Once part of Bavaria, they had proclaimed the German-Austrian province of Sudetenland in October 1918, voting instead to join the newly declared Republic of German Austria in November 1918. However, this had been forbidden by the victorious allied powers of the First World War (the Treaty of Saint-Germain) and by the Czechoslovak government, partly with force of arms in 1919. Many Sudeten Germans rejected an affiliation to Czechoslovakia, since they had been refused the right to self-determination promised by US president Woodrow Wilson in his Fourteen Points of January 1918. The Silesian Uprisings (Polish: Powstania śląskie) were a series of three armed uprisings (1919–1921) of Poles in the Upper Silesia region against Weimar Republic in order to separate the region (where in some parts Poles constituted a majority) from Germany and join it with the Second Polish Republic. By World War I, there were isolated groups of Germans or so-called Schwaben as far southeast as the Bosphorus (Turkey), Georgia, and Azerbaijan. After the war, Germany's and Austria-Hungary's loss of territory and the rise of communism in the Soviet Union meant that more Germans than ever constituted sizable minorities in various countries. The Nazis negotiated a number of population transfers with Joseph Stalin and others with Benito Mussolini so that both Germany and the other country would increase their ethnic homogeneity. However, these population transfers were not sufficient to appease the demands of the Nazis. 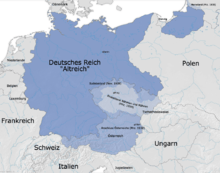 The Heim ins Reich rhetoric of the Nazis over the continued disjoint status of enclaves such as Danzig and East Prussia was an agitating factor in the politics leading up to World War II, and is considered by many to be among the major causes of Nazi aggressiveness and thus the war. Adolf Hitler used these issues as a pretext for waging wars of aggression against Czechoslovakia and Poland. On March 7, 1936, Hitler sent a small expeditionary force into the demilitarized Rhineland. This was a clear violation of the Treaty of Versailles (1919, official end of World War I), and as such, France and Britain were within their rights, via the Treaty, to oust the German forces. British public opinion blocked any use of military force, thus preventing French action, as they were internally divided and would not act without British support. In 1933, a considerable number of anti-Nazi Germans fled to the Saar, as it was the only part of Germany left outside the Third Reich's control. As a result, anti-Nazi groups campaigned heavily for the Saarland to remain under control of League of Nations as long as Adolf Hitler ruled Germany. However, long-held sentiments against France remained entrenched, with very few sympathizing openly with France. When the 15-year-term was over, a plebiscite was held in the territory on 13 January 1935: 90.3% of those voting wished to join Germany. On 17 January 1935, the territory's re-union with Germany was approved by the League Council. On March 1, Nazi Germany took over the region, and appointed Josef Bürckel as Reichskommissar für die Rückgliederung des Saarlandes, "Imperial Commissioner for the re-union of Saarland". As the new Gau was extended to the Rhine, including the historic Palatinate, the region's name was changed again on 8 April 1940 to Gau Saarpfalz (Saar-Palatinate). After the Battle of France, the re-annexed French département of Moselle was incorporated in the Reichsgau. The Allies were, on paper, committed to upholding the terms of the Treaty of Versailles, which specifically prohibited the union of Austria and Germany. This notwithstanding, the Anschluss was among the first major steps in the Austrian-born Adolf Hitler's long-desired creation of an empire including German-speaking lands and territories Germany had lost after World War I. The events of March 12, 1938, marked the culmination of historical cross-national pressures to unify the German populations of Austria and Germany under one nation. However, the 1938 Anschluss, regardless of its popularity, was enacted by Germany. Earlier, Hitler's Germany had provided support for the Austrian National Socialist Party (Austrian Nazi Party) in its bid to seize power from Austria's Austrofascist leadership. Fully devoted to remaining independent but amidst growing pressures, the chancellor of Austria, Kurt Schuschnigg, tried to hold a plebiscite. Although Schuschnigg expected Austria to vote in favour of maintaining autonomy, a well-planned internal overthrow by the Austrian Nazi Party of Austria's state institutions in Vienna took place on March 11, prior to the vote. With power quickly transferred over to Germany, the Wehrmacht troops entered Austria to enforce the Anschluss. The Nazis held a plebiscite within the following month, where they received 99.73% of the vote. No fighting ever took place and the strongest voices against the annexation, particularly Fascist Italy, France and the United Kingdom (parties to the Stresa Front), were powerless or, in the case of Italy, appeased. On September 29, 1938 Adolf Hitler, Neville Chamberlain, Benito Mussolini and Édouard Daladier signed the Munich Agreement. The Czechoslovak government capitulated on September 30 and reluctantly agreed to abide by the agreement. The settlement gave Germany the Sudetenland starting October 10, and de facto control over the rest of Czechoslovakia as long as Hitler promised to go no further. Hitler and Chamberlain signed an additional resolution determining to resolve all future disputes between Germany and the United Kingdom through peaceful means. This is often confused with the Four-Power Munich Agreement itself, not least because most photographs of Chamberlain's return show him waving the paper containing the resolution, not the Munich Agreement itself. Without fortification which was built in Sudetenland, Czechoslovakia was now defenseless. On October 5, Edvard Beneš resigned as President of Czechoslovakia, realising that the fall of Czechoslovakia was fait accompli. Following the outbreak of World War II, he would form a Czechoslovak government-in-exile in London. On 13 March 1939, Nazi armies entered Prague and proceeded to occupy the remainder of Bohemia and Moravia, which was transformed into a protectorate of the Reich. The eastern half of the country, Slovakia, became a separate pro-Nazi state, the Slovak Republic. Prime Minister Chamberlain felt betrayed by the Nazi seizure of Czechoslovakia, realising his policy of appeasement towards Hitler had failed, and immediately began to mobilize the British Empire's armed forces on a war footing. France did the same. Though no immediate action followed, Hitler's move on Poland in September started World War II in Europe. By late 1938, Lithuania had lost control over the situation in the Memel Territory. In the early hours of 23 March 1939, after a political ultimatum had made a Lithuanian delegation travel to Berlin, the Lithuanian Minister of Foreign Affairs Juozas Urbšys and his German counterpart Joachim von Ribbentrop signed the Treaty of the Cession of the Memel Territory to Germany in exchange for a Lithuanian Free Zone in the port of Memel, using the facilities erected in previous years. 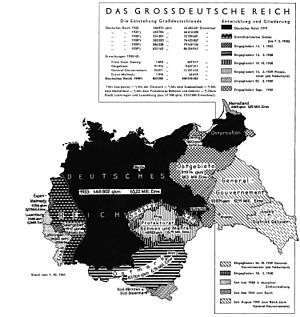 Territorial expansion of Germany proper from 1933 to 1941 as explained to Wehrmacht soldiers, a Nazi era map in German. After invading Poland in 1939, Germany annexed the lands it was forced to give to a reformed Poland in 1919–1922 by the Treaty of Versailles, including the "Polish Corridor", West Prussia, the Province of Posen, and East Upper Silesia. The Volkstag of the Free City of Danzig voted to become a part of Germany again, although Poles and Jews were deprived of their voting rights and all non-Nazi political parties were banned. Parts of Poland that had not been part of Wilhelmine Germany were also incorporated into the Reich. Katowice District (Regierungsbezirk Kattowitz), or unofficially East Upper Silesia (Ost-Oberschlesien), which included Sosnowiec, Będzin, Chrzanów, and Zawiercie Counties, and parts of Olkusz and Żywiec Counties. These territories had an area of 94,000 km² and a population of 10,000,000 people. The remainder of the Polish territory was annexed by the Soviet Union (c. 52%; see Molotov-Ribbentrop Pact) or made into the German-controlled General Government occupation zone. 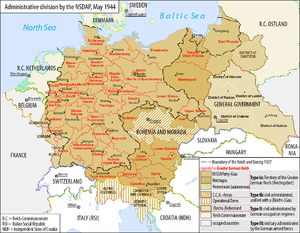 After the German attack on the Soviet Union in June 1941, the Białystok Voivodeship, which included the Białystok, Bielsk Podlaski, Grajewo, Łomża, Sokółka, Volkovysk, and Grodno Counties, was "attached to" (not incorporated into) East Prussia, while East Galicia was added to the General Government. After the invasion of France in 1940, Germany annexed the départements of Bas-Rhin, Haut-Rhin and Moselle (Alsace-Lorraine). The German government never negotiated or declared a formal annexation, however, in order to preserve the possibility of an agreement with the West. Luxembourg was invaded and occupied by German Forces in June 1940. It was formally annexed to Germany in August 1942. From: History of Slovenia "After Yugoslavia fell, Germany, Italy, and Hungary each annexed parts of Slovenia, the largest part being Lower Styria which was annexed to the "Ostmark" (Nazi German Austria)." See Annexation of South Tyrol to Nazi Germany and Italian Social Republic. All areas that were incorporated into Nazi Germany between 1937 and 8 May 1945 were de facto repudiated at the Yalta and Potsdam Conferences, and were therefore non-issues in the post-war division of Nazi Germany. One exception was Memelland, the incorporation of which at the end of March 1939 was recognised by the UK and France, but not by the USA. As it became evident that the Allies were going to defeat Nazi Germany decisively, the question arose as to how to redraw the borders of Central and Eastern European countries after the war. In the context of those decisions, the problem arose of what to do about ethnic minorities within the redrawn borders. The territorial changes at the end of World War II were part of negotiated agreements between the victorious Allies to redraw national borders and arrange for deportation of all Germans that were east of the Oder–Neisse line. 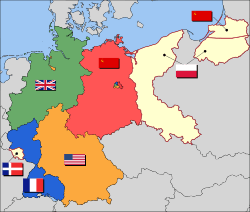 The Allies occupied Germany, but the Western allies and Soviet Union formed separate governments covering specific parts of Germany (West Germany, as well as West Berlin, and East Germany). The Germanies and West Berlin reunified in 1990. The final decision to move Poland's boundary westward was made by the US, Britain and the Soviets at the Yalta Conference, shortly before the end of the war. The precise location of the border was left open; the western Allies also accepted in general the principle of the Oder River as the future western border of Poland and of population transfer as the way to prevent future border disputes. The open question was whether the border should follow the eastern or western Neisse rivers, and whether Stettin, the traditional seaport of Berlin, should remain German or be included in Poland. Originally, Germany was to retain Stettin while the Poles were to annex East Prussia with Königsberg. . Eventually, however, Stalin decided that he wanted Königsberg as a year-round warm water port for the Soviet Navy and argued that the Poles should receive Stettin instead. The wartime Polish government in exile had little to say in these decisions. There was an agreement that the priority would be the unconditional surrender of Nazi Germany. After the war, Germany would be split into four occupied zones, with a quadripartite occupation of Berlin as well, prior unification of Germany. The status of Poland was discussed, but was complicated by the fact that Poland was at this time under the control of the Red Army. It was agreed to reorganize the Provisionary Polish Government that had been set up by the Red Army through the inclusion of other groups such as the Polish Provisional Government of National Unity and to have democratic elections. This effectively excluded the Polish government-in-exile that had evacuated in 1939. 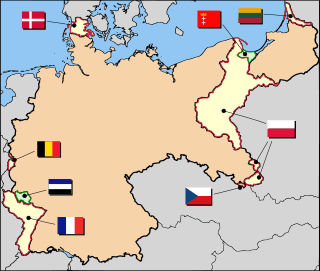 At the Potsdam Conference the United States, the United Kingdom, and the Soviet Union placed the German territories within the 1937 Nazi Germany borders east of the Oder–Neisse line, and with the exception of parts of East Prussia, as formally under Polish administrative control (These were referred to by the Polish communist government as the "Western Territories" or "Regained Territories"). It was anticipated that a final peace treaty would follow shortly and either confirm this border or determine whatever alterations might be agreed upon. Northern East Prussia and Memelland were placed under Soviet administrative control. The 1919 Versailles Treaty created Free City of Danzig was also placed under Polish administration. The German population east of the Oder–Neisse line was expelled. Division of Germany and Austria respectively into four occupation zones (earlier agreed in principle at Yalta), and the similar division of each's capital, Berlin and Vienna, into four and five sectors (one quadripartite sector), respectively. Reversion of all German annexations in Europe after 1937, among these were Sudetenland, Alsace-Lorraine, Austria, the westmost parts of Poland, and others. Germany's eastern border was to be shifted westwards to the Oder–Neisse line, effectively reducing Germany in size by approximately 25% compared to its 1937 borders. The territories east of the new border comprised East Prussia, all of Silesia (except for its westernmost part around the city of Görlitz), the eastern part of Brandenburg, and most of Pomerania (including former Grenzmark Posen-West Prussia). These areas included large urban centres such as Stettin, Breslau, Landsberg an der Warthe and so on. Expulsion of the German populations remaining beyond the new eastern borders of Germany, and ethnically German denaturalised citizens of other states such Czechoslovakia, Hungary, Poland, Romania, and Yugoslavia. France, which had not participated in the Potsdam conference, took its liberties to dismiss this point and therefore refused to absorb any expellees in its zone of occupation. West Germany, East Germany, and the Saarland, 1949. The problem with the status of these territories was that the concluding document of the Potsdam Conference in 1945 was not a legally binding treaty, but a memorandum between the USSR, the USA and the UK. It regulated the issue of the eastern German border, which was to be the Oder–Neisse line, but the final article of the memorandum said that the final decisions concerning Germany were to be subject to a separate peace treaty. Based upon this interpretation of the Potsdam Agreement, the CDU controlled German government maintained that the Oder–Neisse line was completely unacceptable and subject to negotiation. 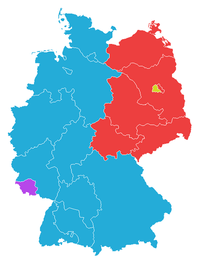 Also the Social Democrats of the SPD initially refused to accept the Oder–Neisse line. Thus, the official German government position on the status of areas vacated by settled German communities east of the Oder–Neisse rivers was that the areas were "temporarily under Polish (or [Soviet]) administration." Between 1970 and 1990, the West German political establishment gradually recognised the "facts on the ground" and accepted clauses in the Treaty on the Final Settlement, whereby Germany renounced all claims to territory east of the Oder–Neisse line. In the Treaty of Warsaw (1970; ratified in 1972) West Germany recognized the Oder–Neisse line as Poland's western border and renounced any present and future territorial claims; this was reaffirmed by both German states in the 1990 Treaty on the Final Settlement with Respect to Germany as a pre-condition for re-union. The treaty was ratified in 1991 by the united Germany. United Germany and Poland then finally settled the issue of the Oder–Neisse border by the German–Polish Border Treaty in November 1990. This ended the legal limbo which meant that for 45 years, people on both sides of the border could not be sure whether the status quo reached in 1945 might be changed at some future date. As part of the 1956 treaty, in exchange for the territory ceded by Germany, Belgium ceded to Germany its territory north of the Fringshaus roads and bounded by the Vennbahn. The detached territory, in 1956 containing 704 inhabitants including refugees, was, prior to its 1956 dissolution and partition between West Germany and Belgium, ruled as an independent territory by Belgian Army Major General Paul Bolle, who enjoyed dictatorial powers. Despite the more extensive annexation proposals of the Bakker-Schut Plan, only a few border modifications were implemented. On April 23, 1949, Dutch troops occupied an area of 69 square kilometres (27 sq mi), the largest parts of which were Elten (near Emmerich am Rhein) and Selfkant. Many other small border changes were executed, mostly in the vicinity of Arnhem and Dinxperlo. At that time, these areas were inhabited by a total of almost 10,000 people. Starting in March 1957, West Germany negotiated with the Netherlands for the return of these areas. The negotiations led to an agreement (German: Vertrag vom 8. April 1960 zwischen der Bundesrepublik Deutschland und dem Königreich der Niederlande zur Regelung von Grenzfragen und anderen zwischen beiden Ländern bestehenden Problemen; short: Ausgleichsvertrag, i.e. treaty of settlement) made in The Hague on April 8, 1960, in which Germany agreed to pay 280 million German marks for the return of Elten, Selfkant, and Suderwick, as Wiedergutmachung. The territory was returned to Germany on August 1, 1963, except for one small hill (about 3 square kilometres (1.2 sq mi)) near Wyler village, called Duivelsberg/Wylerberg which was annexed by the Netherlands. Starting on 16 February 1946 France disentangled the Saar area and established the separate Saar Protectorate, further attaching parts of the Prussian Rhine Province and the Bavarian Palatinate (Saarpfalz). Like the former eastern territories of Germany the Saar area was out of the jurisdiction of the Allied Control Council for Germany and thus no part of Allied-occupied Germany. However, unlike the eastern territories the domestic Saar population was not expelled by the controlling French. With effect of 1 January 1957 the Saar Protectorate declared its accession to the Federal Republic of Germany, as provided by its Grundgesetz (constitution) art. 23 (Little Reunification), thus becoming the new federal state of Saarland. ↑ Cf. the report "Vor 50 Jahren: Der 15. April 1950. Vertriebene finden eine neue Heimat in Rheinland-Pfalz" of the Central Archive of the State of Rhineland-Palatinate on the first expellees arriving in that state in 1950 to be resettled from other German states. ↑ Autocrat's Adieu Time Magazine, October 08, 1956.